You can see the horizon but you can’t see beyond it. When Patti and I are in Townsend, Tennessee one of our favorite activities is it drive up on a parkway where we can sit and watch the sun go down behind Knoxville. As the last sliver of the sun drops below the horizon it is a powerful spiritual experience for us. And as the rays of the sun explode from beyond the horizon it is a testimony to us that Jesus will always light our lives even though darkness has fallen. In today’s scripture God questions Job from beyond the horizon following his trial by fire, while it was question to Job for us it is a reminder that God’s richest blessings lie beyond the horizon and all we need do to keep walking toward the Light of Jesus. 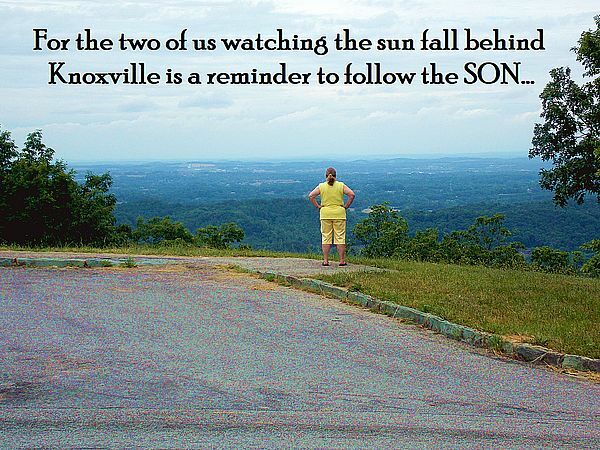 For the two of us watching the sun fall behind Knoxville is a reminder to follow the SON as he leads us toward God’s richest blessings which come at the right time, and just as there is no end to the horizon there no end to God’s blessings.